"This is one of my all-time favorite party foods. For big games or special events, these nachos should get serious consideration for formulating your snack line-up. I recommend serving this with hot sauce on the side, and lots of beer." Season both sides of steak with salt and pepper. Heat oil in a skillet over medium-high heat. Cook steak, turning occasionally, to medium doneness, about 6 minutes per side. An instant-read thermometer inserted into the center should read 135 to 140 degrees F (60 degrees C). Transfer meat to a bowl to let it rest. Pour a splash of water into the skillet; stir to scrape up browned bits and deglaze the pan. Pour this liquid over meat. Allow meat to cool completely. When meat is completely cool slice thickly (about 1/2 inch) with the grain, then cut into thinner strips. Dice by cutting into pieces against the grain. Transfer chopped steak back to the bowl; toss with the pan drippings. Melt bacon fat over medium heat in a pot. Add onions and a pinch of the salt; cook and stir until softened, 5 or 6 minutes. Stir in oregano. Add pinto beans and water. Bring back to a simmer and cook until onions are soft and sweet, about 5 minutes. Reduce heat to low. Mash the beans with a potato masher to your desired consistency. Add additional liquid, if necessary, to achieve your preferred texture. Add the remaining salt to taste. Remove from heat. Place tortilla chips about 2 or 3 deep in a heat proof pan. (You may need more than one pan.) Top chips with spoonfuls of beans and a generous handful of steak pieces. Sprinkle with grated cheese. Bake in preheated oven until cheese is melted and edges start to brown, about 10 minutes. Scatter diced ripe avocado, diced onions, diced tomatoes, and diced jalapenos over the top. Drizzle nachos with sour cream and garnish with chopped cilantro. For best flavor, toss the diced avocado with a bit of lemon juice and salt before adding. Broiling Option: When you assemble the nachos, if the beans are still hot and the steak isn't too cold, you can broil the nachos until cheese is melted and edges are brown, 2 to 3 minutes. I followed the recipe, but also added shredded lettuce :-) Salad:-)).. Was Yummy!!! A bit of a pain to make but THESE ARE THEY GOOD. As my nickname goes I rarely give a 5 star (it is the BEST after all) but these nachos really are very good. 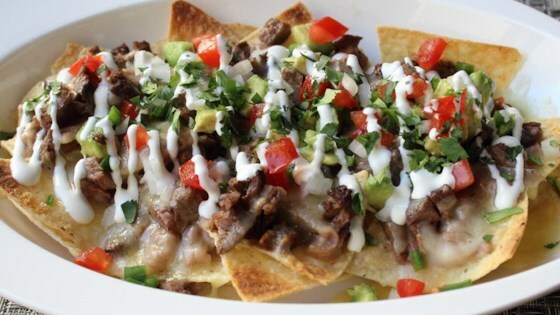 We absolutely LOVE these nachos. The chipotle seasoning is crucial. Great recipe! I modified it slightly by using hamburger instead of steak because I didn't have time to marinate it like I usually do. I also added lettuce and tomatoes. Loved it!